“I put the spoon in the cereal. I scoop the cereal. Here comes the cereal,” Dad says to baby as the child opens her mouth to scarf down the scoop. 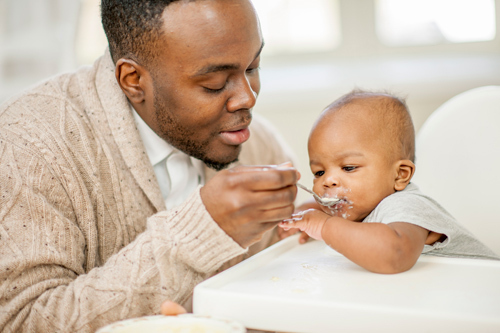 To talk through routines like this with infants may seem silly at first, but when we do, we help them increase their capacity to listen and understand. The ability to listen and understand is a key component to healthy development. Below we’ll look at some examples to watch for in children that illustrate progress, and we’ll cover a few quick tips to help facilitate progress. lift up arms when you say “up” and motion to pick them up. use the same familiar words often when going through regular routines with the infant present. Do you have some strategies to share? Comment below.